Parks play such a vital role in the health and recreation of a community. Kids need an open space to explore and be kids. With barely one acre of parkland per 1,000 people, this is exciting news for the residents of South LA. Tim Keller is the founder and pastor of New York's Redeemer Presbyterian Church. He is also the author of some really great books, such as Generous Justice, Ministries of Mercy, and The Reason for God. In the following videos, he speaks about being a Missional Church and some characters of a Missional Community. How are you living missionally? When I was a kid, almost every birthday party I had involved a sleepover. Can you imagine what it would be like as a kid without the ability to have friends over? Not everyone has been blessed with a home to call your own. This article shares some of the struggles of some children who do not have permanent homes. Practice the ministry of presence! Learn how YOU can practice the ministry of presence with CSM! New Facility for Women on Skid Row! Exciting news for Skid Row is the opening of a new downtown women's clinic. The new expansion can now serve up to 3,500 women a year and hopes to serve the women in a holistic way. 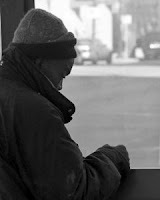 Lent 2011: A Franciscan Blessing from World Vision ACT:S on Vimeo. Free Youth Ministry Lesson on Poverty! The great folks over at YouthWorker Journal just posted a fantastic, FREE resource for youth workers to take advantage of. If you're looking for ways to dig deep into justice issues like poverty, check out Youth Ministry 360's The Least of These: God, Poverty and You. They provide a free sample lesson and video for you to utilize! Learn how YOU can engage in hands-on service through CSM! A creative ministry in downtown Manhattan has been providing housing solutions and other resources to the homeless community for years. Check out this recent NPR article that explores their innovative technique that's potentially ending homelessness in their neck of New York!